When they swim freestyle, everyone has to kick to some extent to keep their body position high in the water. But generally, as distance swimmers and triathletes, we're looking to minimise the effort we put into our kick. The propulsion from leg kick is very small; even if you have a fantastic leg kick technique it's unlikely to be more than ten percent of your overall propulsion. It's much more efficient to spend that energy on arm propulsion instead - you'll move much faster through the water as a result. Many swimmers - we call then 'Kicktastics' - are very kick-dominant in their stroke. Subconsciously they are relying on their kick for propulsion and swim with a continuous, powerful leg kick. Rather than the arm stroke leading the kick timing, with Kicktastics it's the other way around. Their kick very much comes first! How to spot one: Other than the very strong kick, they often have a slight pause or slowing in their arm movement as the hands enter into the water at the front of the stroke - this is their arm timing falling in line with the kick timing. Using a pull buoy between your legs, perform 15m of the Scull #1 drill from our DVD Boxset. This is a simple but very effective sculling exercise at the front of your stroke, tuning into a light pressure on the palm of the hands: 'feeling the water'. Then after 15m, enter into full stroke swimming - still with the pull buoy - feeling that pressure on the palms of your hands and focusing on pressing it backwards to the wall behind you. After approx 20m of swimming like this, part your legs slightly and release the pull buoy (be wary of any other swimmers in the lane!). Carry on swimming as you were when you had the pull buoy - focusing on that light pressure on the palms of your hands. Of course, you will need to kick slightly without the pull buoy but keep the focus on your arm stroke - giving you the feel of arm led propulsion. Relevant link: Our webpage all about kicking. When you're trying to improve your freestyle stroke it's natural to concentrate really hard on what you are doing. Sometimes heavy concentration isn't the best way to improve. It tends to make your movements robotic and often shuts out your natural feel for the water. Here's something to try: When you swim, experiment a little and try a 'light focus' instead. Treat your swimming laps like a game and relax as if it's for fun and it doesn't really matter*. Take a few slow deep breaths before you start a lap, notice the pool environment around you and just enjoy being there. Start swimming at a steady pace as if on auto pilot and lightly monitor what you are doing as if out of curiosity. Introduce a small change or adjustment to your stroke and see how it feels, does it feel better or worse? Be lightly aware of the knock on effect this has on other parts of your stroke or timing. Very often you’ll discover something about your stroke which will really help your swimming. When we watch elite swimmers they look very fluid and relaxed in the water. Remember, it's not just their stroke that is relaxed and unforced but their minds too. *actually, swimming is fun and it doesn't really matter! Also this month, a special mention for a good friend of Swim Smooth, Brad Hosking, who's undertaking some huge feats of endurance over the next few months to raise money for the Princess Margaret Hospital here in Perth. A local fire-fighter, Brad's running the entire half marathon at next weekend's Busselton Half Ironman in fire-fighting gear, including face mask. Incidentally the mask will be fed with an air mixture, not pure oxygen as this would be considered performance enhancing! Then, commencing on the 16th August, Brad's joining up with 18 other Aussie fire-fighters to complete an epic 26 day, 7392km charity run across America. To be joined by countless American firefighters, the team will run from Los Angeles, through Las Vega, Arizona, Albuquerque, Oklahoma, Houston, Memphis, Charlottesville, Washington, Balimore and Pennyslvania before arriving at Ground Zero on September 11th. The run is being held in memory of the emergency workers who lost their lives on September 11th 2001 and to raise awareness of the role that emergency workers play within our socities during events such as the Victorian Fires of 2009 and the Californian Wildfires of 2008. You can find out more about the events and Brad's fund-raising here. Please give generously to his Everyday Hero donation page. This week on Feel For The Water we have an interview with Pro Triathlete Scott Neyedli and an accompanying video analysis of his stroke. A couple of weeks ago Scott swam 44:35 at a slightly tide assisted Ironman Australia, we're sure you'll find the interview and video analysis a fascinating insight into swimming at the very front of the pack. Link: See our video analysis of Scott's stroke here. 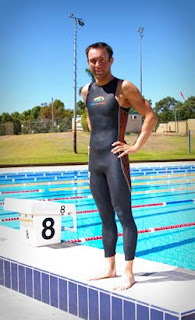 SS: Hi Scott, welcome to the Swim Smooth Blog! Thanks for dropping by to share with us some details of your Ironman training. SN: Not at all, nice to be here, thank you for inviting me to your Swim Smooth video analysis last month. SS: Let's start by talking about Ironman Australia last Sunday (March 28th), you had a cracking race finishing a very close second overall behind Patrick Vernay. You must be pretty pleased with your race? SN: Yes I was very happy with another podium finish, I pushed for my second Ironman win but the wheels fell off in the latter stages of the marathon. Patrick is a great champion here in Australia, hopefully I can reverse this when I come to race here again. SS: I hear that you got within 20 seconds of catching Patrick on the run? That must have been a tantalising experience? Care to share any thoughts about how that felt and have you ever been in a similar situation before? I know that many of our readers will often be fighting it out for Kona slots and will be interested in your answer. SN: I think everybody racing Ironman has their own inner battles throughout the day. It's the same at elite level as it is for those looking for a Kona slot or wanting a finisher's medal. We all have bad patches at some point and it's just a case of managing each scenario as it occurs. It's the second time I've raced Patrick and it was a different experience compared to Busselton last December. In Busso I wasn't able to reel him in close until the last 10K of the marathon before he pulled away. This time around was quite different. The gap during the marathon was fluctuating throughout, ranging between 20 and 80 seconds where we both seemed to have good spells and bad spells. I twice had gastric stomach issues in the first 20km but I was still running well, he then had some cramp issues mid way then it was my turn when we came to the last miles on my last trip up the hills section. The race for the win got away from me which was a little heart breaking and I lost a few mins in the final kms, it was just a case of survival, getting to the finish line and holding second place. I'm still proud of how I raced. SS: So let's talk about the swim then at Ironman Australia. We were lucky enough to catch up with you here in Perth the week before the event and film your stroke from a variety of angles in one of the awesome outdoor 50m pools at Challenge Stadium. I have to say that you were looking really impressive during the filming and having not seen you swim before I was very impressed with your form in the water - you certainly looked set for a great race at IMOZ which proved to be the case when you produced the second fastest time of the day in 44 mins and 35 seconds for the 3.8K distance. For those of our readers out there who are geeky like me, they'll know that this equates to 38 consecutive 100m splits in under 70 seconds. How did you feel out there? SN: Overall yes I'm very pleased with the swim performance and a PB! The course could be short but you never know I'll take it with grace. I was getting good tell-tale signs that my swim was sharpening up in my final sessions and I thought a fast time was possible. The swim was tide assisted downstream plus there was an extra 400m point to point at the start (with the tide behind) before the two loop swim course began. A lot of the credit has to go to Adrian Cominotto who lead me through most of the swim and was first out the water, had I known it was going to be a swim course record I may of contested the swim exit but my mind was more focussed on getting a good T2 before beginning the bike leg. Having said that, the only thing I was disappointed was missing the chance of a clean start. A car horn set off the main pack and I didn't leave until 15-20 seconds later having realised they weren't going to call them back for a restart. I stayed focused but it cost me the chance of a break away as I had to work my through the pack that had jumped ahead of me in the first 400m. Once I got to the front I led the race briefly with Paul Ambrose in the early stages of the first loop before Adrian came through to lead. SS: And did you think about anything specifically with respect to your technique whilst you were completing the swim? Did you, for example, make use of any drafting opportunities in the swim? We're always reminding our swimmers that you can save 18-25% of your energy expenditure by mastering this technique and yet so few triathletes make enough time in their training to practice this. What are your thoughts on that? SN: Exactly that. Because I had to work extra hard in the first 4-500 meters from the premature horn, I tried to do this strategically and smart by working in and out of swimmers drafts and also the small main group ahead of me. Once I was out of trouble and at the front of the swim I was quite happy and maybe a little relieved when Adrian came to the front – as I was a little concerned of the amount of energy I'd used up to get up to the lead canoe and needed a break to recover. I slipped onto Adrian's feet just concentrating on settling my breathing down and lengthening my swim strokes to feel easier and trying not to touch his feet on the draft. The pace settled down but still there was changes of pace to adapt to - normally around the turn buoys and then in the last 3-400m as we headed back into the beach for T2. SS: How hard would you say you set off at the start of the swim in an event lasting (for you) just under eight and a half hours? Presumably you manage and control your pace well in the first 400m? Any advice for our readers on this? SN: No, not at all - actually the first few hundred metres is maybe the most explosive of the race (for me). My first objective is to get clear space from the competitors around me so I don't get pinned and then to find open clear water as I find it easier to swim through that than the broken water carnage further back before the swim packs take shape (although not in this case from the start described earlier). Normally the swim start presents the best opportunity to breakaway at the front end of the swim before settling into my pace and hopefully not towing too many other swimmers. If there's a better swimmer than me I more than happy to take the tow as I know my buoy spotting isn't too hot when it comes to swimming the best line. SS: OK, so just taking a quick step back then to your past. In 2007 you won Ironman UK and smashed the field during this event. Prior to this though you are relative newcomer to the sport, having taken it up as a way of working off the pounds from your previous job in the oil and gas industry in Aberdeen, Scotland. What is your background as a youngster involved in sport, particularly your swimming history? SN: I enjoyed most school team sports such as football, then rugby through primary and secondary school but I turned my focus to club swimming at about the age of 14 or 15. I first entered the Aberdeen Dolphin club squads at 10 or 11 which was a little later than other kids my age and I wasn't really competitive until my early teens. I was initially a backstroker then laterally focused on my medley in my late teens. From about the age of 15 or 16 I would medal regularly at district level but at best A or B final at the Scottish Nationals. I wasn't a talented swimmer but I was a good worker and would race better over middle and long distance swims. I stopped swimming in my last year of University at 21 and had a break from sport due to work commitments thereafter and got into triathlon and swimming again at 26 - I also dabbled a bit with masters swimming and also a few open water races but triathlon gave me the bug again. SS: So, our readers can read a lot more about you if they wish at www.scottneyedli.com - you've got some great videos up there and a super-regular Blog with lots of details of what you're up to. Care to tell us a little bit about some of your sponsors Scott and how they help you achieve your goals? SN: My team contract wasn't extended last December so it left me in precarious position of trying to find a new main sponsor (which I'm still searching) and to source new equipment sponsors over the Christmas period. Triathlon is so diverse that without great sponsor support, it wouldn't be possible to be doing what I'm doing. All my supporters can be viewed on my website for further details. I'm proud to be supported by Macintosh Plant Hire (Aberdeenshire) and Xosize (Melbourne) who helped with my travel to my latest Ironman race. Aberdeen Sports therapy has supported me throughout my career and have been very instrumental in the remedial side of body maintenance, injury prevention and sports performance when I began training full time. BlueSeventy has supported me for three seasons with their top of the range Helix Wetsuits and PZ3 Fastskins that keeps me at the top end of swim ware evolution. Most recently through UK Multisport Distribution, I have signed bike, clothing apparel, helmet and eye protection sponsorships with Blue Competition cycles, Fusion and Ekoi respectively. Through Chocolate Distribution I have wheel support with Prima Rolf. Both through wind tunnel testing, power meter tools (I have supported by SRM and Computrainer), nutrition testing and the Swim Smooth video analysis it gives me the opportunity to tweak technique and positions that optimise my performances as best as possible. At elite level you're always looking for a half percent here and there as this all equates to improved time or more energy conservation come race day. Working with a great team of like minded sponsors all contribute my results. SS: OK, back to your swimming technique then. When you were being filmed up at Challenge Stadium one of the things that was immediately apparent about your stroke was a lack of glide or dead-spots at the front of your stroke... your rhythm and timing was spot on and the flow within your stroke was excellent. You seemed to achieve this when swimming at race pace with a relatively high stroke rate of approx 85 strokes per minute. Have you ever specifically trained this aspect of your stroke? SN: Stroke rate (counting) isn't something I personally focus on (but prior club coaches did) but probably translates to the changes of pace (or varying of turnaround time) I add within many of the main sets I write for myself. SS: What does a typical swim training week look like for you, both with respect to volume and intensity? SN: Typically I swim train 4 times a week (2 sessions endurance based, 2 sessions shorter distance base at or above threshold) + 1 recovery swim where I work more on drills and technique. My sessions range between 3-5k with warmup, drills, main set and cool down. It depends on the facilities or environment where I'm living but if a squad session fits my overall training plan I try to do at least two sessions with a swim squad otherwise the longer distance sessions I train by myself. SS: Do you have a favourite swim session that you care to share with us targeted specifically at Ironman distance events? SS: How much open water swim practice do you typically get in during your training? Do you see this as being important to a triathlete's preparation? SN: I don't personally do any open water practice until race week. I'm at a competent level of open water experience that I'm happy to have 1-2 sessions on the swim course for familiarisation before I race. Having said that for anyone that's new to open water swimming and triathlon I would recommend some sessions to firstly familiarise themselves swimming close to other people, swimming in different water temperatures and getting use to the benefits of a wetsuit (different catch position) and also how water conditions can vary i.e. current, swell or chop that race courses can present. SS: Many triathletes like to know that they can swim the complete 3.8km distance before the event. You are obviously a very accomplished swimmer in your own right - how often do you typically do a continuous 3.8km swim in training would you say? SN: I haven't – my overall training volumes add up to 5k so I know I can swim the distance. SS: Scott, thanks for taking the time to do this interview. You're a busy guy with a huge amount of talent and we really wish you the very best of luck in the future with your triathlon endeavours. Any last morsels of advice for our readers out there? SN: Train smart, eat smart, rest smart and be the best you can be! Cheesy Friday - The Results! "Today I do what others will not, so tomorrow I do what others cannot." "See your future - Be your future"
"Of course it's hard. It's supposed to be hard. If it wasn't hard, everyone would do it. The hard... is what makes it great." or simply "Nothing great is easy." "Luck: when opportunity meets preparation and hard work." "The only time success comes before work is in a dictionary." "Throw your heart off the blocks and the rest will follow." "More is sometimes better, better always is." "The hardest piece of fitness equipment is the front door." We hope you had a good giggle from reading these (and maybe even some inspiration too!). "If you always do what you've always done, you'll always get what you've always got!" Here are some more below but what are your favourites? "No-one ever excused his way to success"
"Damned if you do, bored if you don't"
"There's always free cheese in the mouse trap, but the mice there ain't happy"
"The only difference between a rut and a grave is their dimensions"
"Of course it's hard. It's supposed to be hard. If it wasn't hard, everyone would do it. The hard... is what makes it great"
To submit yours, simply reply to this email or send an email to blog@swimsmooth.com. We'll collate your replies, pick the best ones and post them out on Monday to cheer you up on your return to work! Include your name if you'd like to be credited for your submission. By the way: We occasionally get asked about our spelling. Swim Smooth is an Anglo-Australian company so we use เกมยิงปลา HappyFishingBritish English spellings, we hope you catch our gist! You may not know this but nearly everyone's freestyle stroke has 'sweet spots' in it at certain stroke rates (strokes per minute). These are strokes rates where your efficiency is higher, meaning you move more quickly though the water for the same effort. Even if you swim regularly with a Wetronome you may not realise where these sweet spots lie. That's why we invented The Stroke Rate Ramp Test - a method of assessing the full spectrum of your stroke. With a little help from a coach or friend on the poolside you can run through the Ramp Test and find stroke rates where you swim more efficiently. These are points where your stroke technique clicks - even if it doesn't feel that way at first. For instance, you may normally swim at 55 strokes per minute but find that at 59 strokes per minute you swim faster for less effort. Train and race at these sweet spots to get the very best out of your swimming. Or jump ahead and watch our demonstration video right way. Even those who don't own a Wetronome will find this interesting to watch!